The feature-rich KE2 Condenser Fan Control allows for the control of up to 14 fans, on two separate interlaced circuits sharing a common condenser. 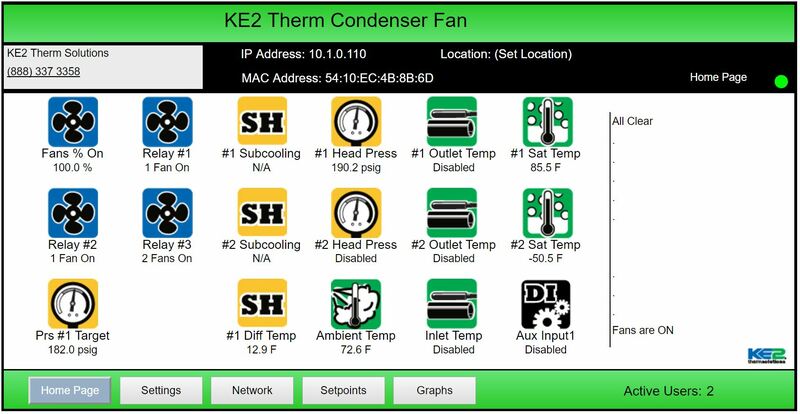 With five control modes, which each offer four control types the KE2 Condenser Fan control can work in most applications, and the controller is Title 24 Compliant. Additionally, several of the control methods allow for floating head pressure. The Control Modes are : Fixed (Head) Pressure, Saturated Temp to Ambient Air Temp, Subcooling (drop leg temperature) Condenser Liquid Temp to Ambient Air Temp, or Condenser Inlet to Condenser Outlet Temp. And each of these Control Modes have Control Types: Cycle Fans, VFD, EC Motors, or EC Motors w. Fixed Speed Motors.